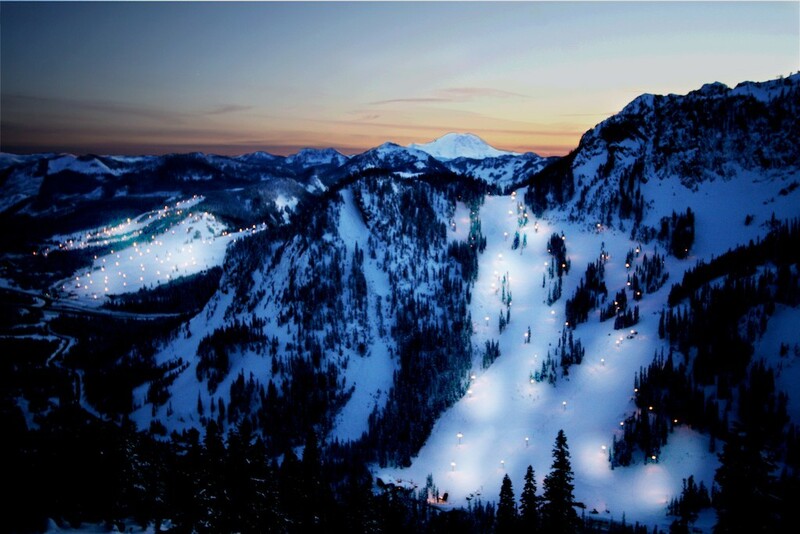 The Summit at Snoqualmie sits 45 minutes east of Seattle on I-90, in the heart of the Mt.Baker/Snoqualmie National Forest. The Summit consists of three base areas: Summit West, Summit Central and Summit East. There are 1,100 acres of terrain with vertical ranging anywhere from 765 feet to 1,100 feet. The average snowfall is 435 inches per year. Summit Central has a superpipe, black diamond to beginner runs, top-to-bottom terrain parks, glades, and tubes. Summit East, open weekends only for alpine skiing and riding, has consistent fall line terrain, good tree runs and the Nordic Center's 50 kilometers of skate and classic groomed trails. Summit West has the West 52nd Terrain Park, and the West Greenhorn Park for those new to the terrain park scene. The Summit Learning Center has consecutive week programs, daily lessons, or private lessons. Equipment Rentals are featured at every base area. The Summit Tubing Center provides hours of good old-fashioned winter fun. And snowshoes are available for rent at the Silver Fir Outpost.